Ski access with resort shuttle 7 mins. We love it. Good value for money. I thoroughly enjoyed my 3 night stay at the lovely Lost Lake Lodge last week. My son had asked me to join them & my 2 young grandchildren for a spur-of-the moment get-away from our homes in the Fraser valley. 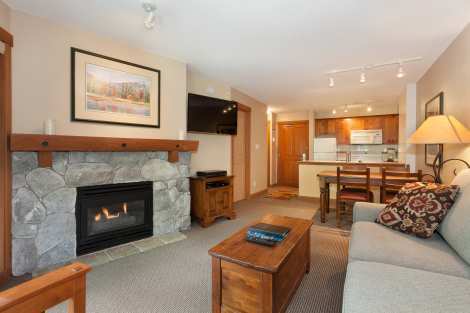 Our suites were lovely, the staff friendly & helpful and a short walk from the lodge to the walkway to the lake, beach & surrounding lake pathway. The pool area also very nice, including the weight room & games room, where I even played pool with my 6-yr. old grandson, who of course WON! We're already talking about the next time we head up there! Maureen Maple Ridge, B.C. Look forward to booking again. We were mostly happy with our experience. The only issues we had were with the heat (it was cranked way too high), and our room was close to a roof that was extremely loud with rainfall - thundering, in fact (room 419). Because the room was hot we wanted to open the windows but could not due to the noise. Loved the location, especially with the shuttle stopping right out front of Lost Lake Lodge (not sure if that was mentioned in the registration but you should) ... unit was very clean and would be great for an extended stay.